Uisge Source waters come from 3 whisky regions in Scotland (Islay, Highland & Speyside) and have been carefully selected to perfectly complement Single Malt Whiskies. 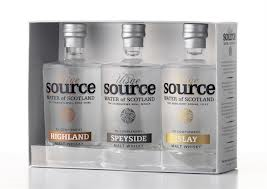 This Uisge Source Triple Pack includes 3 x 10cl Uisge Source bottles presented nicely in a Uisge Source presented gift box. Its hard character, rich minerality from the nearby distilleries' water and filteration leave this water compliment well-suited for pairing with a rich Highland dram. This was bottled at the Ardilistry Spring on Islay and is slightly acidic but the flavour pairs beautifully with a peaty single malt! Bottled from the Cairngorms Well in Moray, it's a soft water, very low in minerals and when added to an Islay malt, the result is indeed very close to heaven.